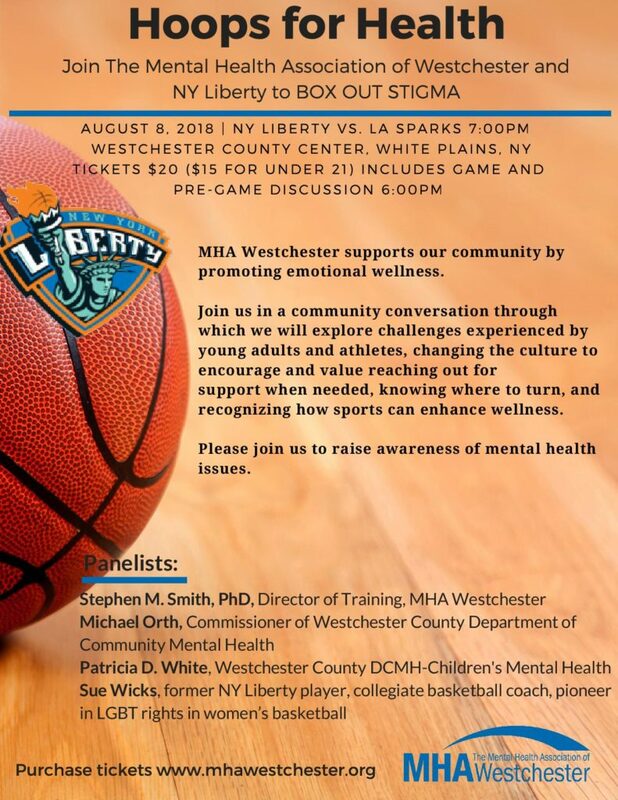 The Mental Health Association of Westchester (MHA), and NY Liberty are joining together for a community conversation through which we will explore challenges experienced by youth, young adults and athletes, changing the culture to encourage and value reaching out for support when needed, knowing where to turn, and recognizing how sports can enhance wellness. This pre-game thought provoking panel discussion will begin at 6:00 p.m., followed by an action packed NY Liberty game vs. LA Sparks at 7:00 p.m. Hear first-hand on how to help our youth, young adults and athletes manage stress and anxiety, and understand the importance of taking care of one’s mental and physical health. Takeaway valuable insights, tools and resources for support and to know where to turn to get help. Panelists include: Sue Wicks, Former NY Liberty Player, collegiate basketball coach, pioneer in LGBT rights in women’s basketball, Stephen M. Smith, PhD, Director of Training, MHA Westchester, Michael Orth, Commissioner of Westchester County Department of Community Mental Health and Patricia White, Children’s Services Westchester County Department of Community Mental Health. Proceeds will benefit The Mental Health Association of Westchester (MHA), a community-based non-profit that provides behavioral health services, community education and advocacy work. The tickets are available online for $20.00 each and $15.00 for under 21 years old. The seats are in the upper level (rows C-F) with close-up views of the court and all the action. For more information and to purchase tickets, visit www.mhawestchester.org.